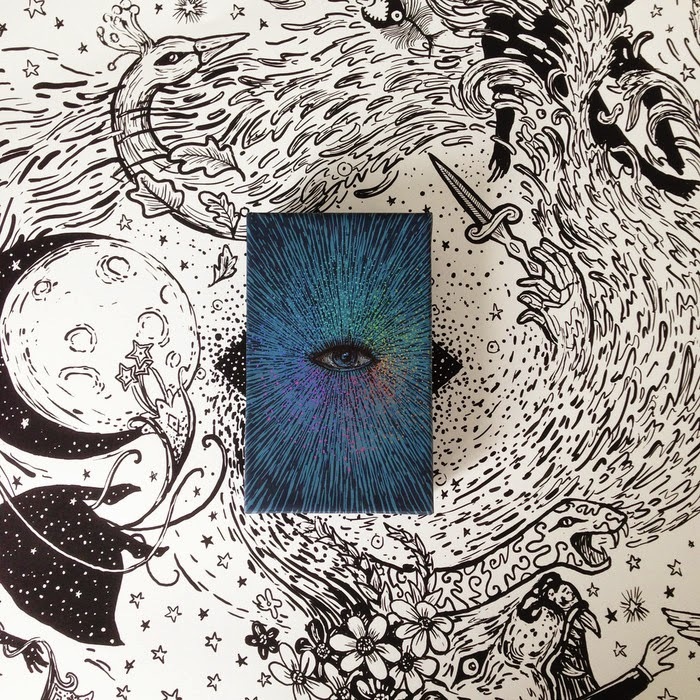 Last year James R. Eads had a kickstarter campaign entitled "The Visions Project: Tarot Cards & Art Prints" to publish his 79 cards deck in a bi-chrome scheme, a modern reinterpretation of th WCS deck and also a majors only + extra card prints set that are a color reworking of that deck with some other changes, tweaking - now he's back with the follow up on that project so to speak, the "The Prisma Visions Tarot". First let's begin with the beginning, the Light Visions tarot (first self published as a major arcana deck before the kickstarter project and than as the 79 cards deck, both OOP now), a very nice deck that is modern yet ancient at the same time, technological as natural. 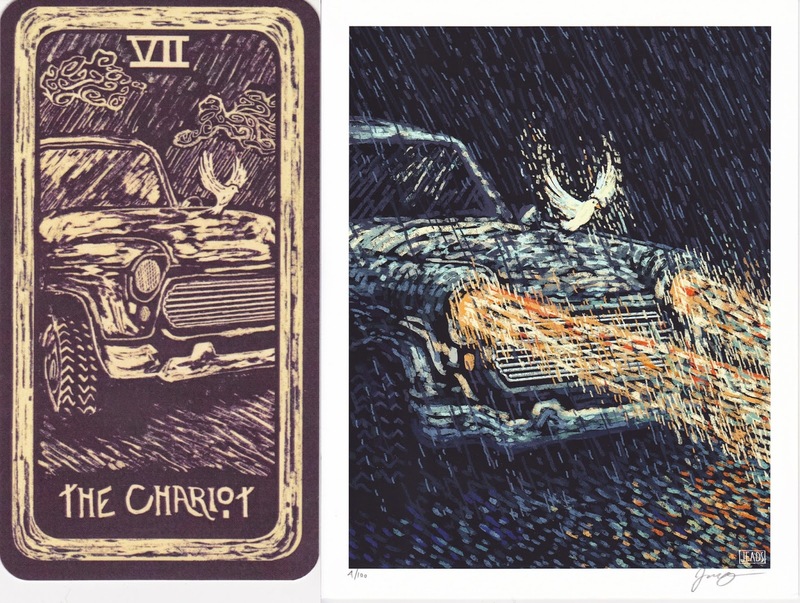 The both the modern as the technological parts can be seen in the contemporary some/many re-workings of the tarot archetypes like the chariot that became a car coming towards us,from the left to the right hand side of the card, the ancient feeling comes from the technique used: hand drawn images in a style that are reminiscent of old woodcut blocks. The 2013 kickstarter campaign was to fund that deck and the Prisma Visions Collection, 22 majors plus the extra card that flowed from those images, similar, but different, not only because those are giclee prints but they underwent some evolution. Take for example the chariot here below where the Prisma Visions version not only gained colors but also in dynamism due to the headlights being turned on. And now James is back for a full 79 cards version of the Prisma Visions, as with the Light Visions tarot there is an 'interesting 'thing' with the minors arcana, if you put every card of a suit one next to it's predecessor it forms one single continuous scene, for now only the suits of Chalices and wands are ready. Baba studio has done it again, after many years passionate work this summer they have finally published what was one of the most anticipated deck of the year, and it is good, very good even! Many have been talking, waiting, wanting this deck ever since it was first mentioned and the number of individuals interested only rose despite it's long genesis, the longest in the very successful parcours of Baba stdio must say...and once it was available for pre-order I jumped on the occasion to obtain it (as many others did), the best proof it how successful it is, is the fact that the deluxe limited edition, despite its price is already sold out! But was it worth it or is it just one of those hypes the tarot world has? My answer is simple: YES it is worth. A work of love and dedication combining the tarot with Lewis Carroll's Alice in Wonderland and Alice Through the Looking Glass by means of collage art, a technique they have proven in the past to master at a very high degree. 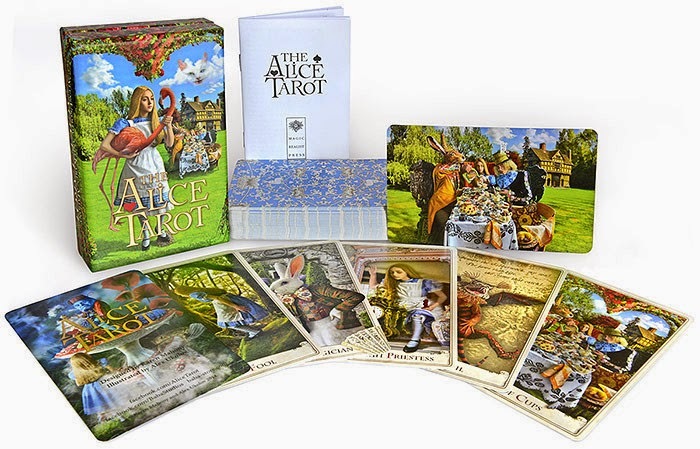 Due to the source material and the understanding Karen and Alex have of the tarot this deck resulted in more than just another WCS-clone with happens to be Alice themed, no this is a fresh exciting cross-fertilization between the two resulting in a 'child' that will fill you with wonder, and make you wonder if the Cheshire Cat was correct when saying "Oh, you can't help that. We're all mad here. I'm mad. You're mad." But then (some) madness never hurt, and where the artist and geniuses not considered mad by those who did not understand them? It is a nice tradition at Baba to have 2 variations of a card, in the Alice these are 2 lovers cards, both very nice and very different from your 'classic' lovers. One card is the The Walrus and the Carpenter. 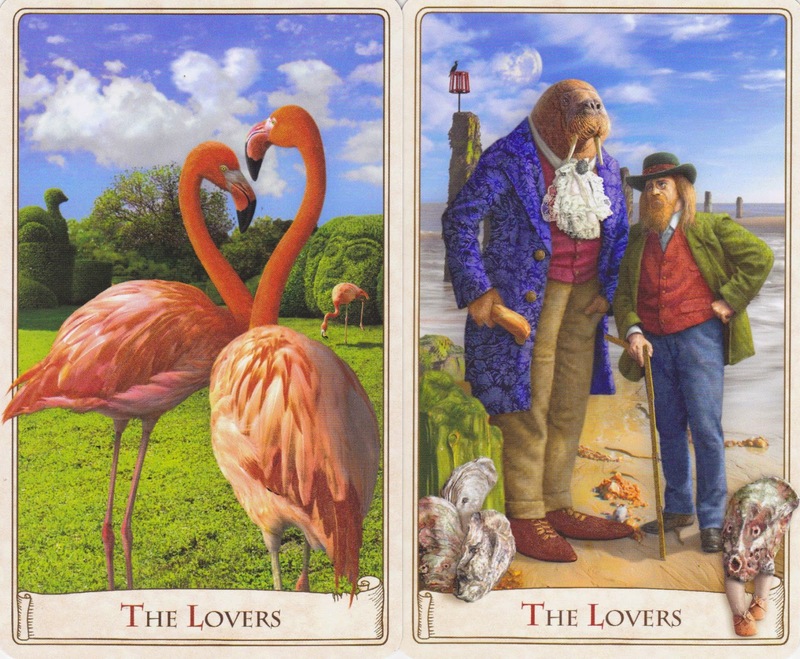 the other is showing flamingo's whatever version you choose to use (or be bold and use both) they will make an interesting impact on your view of the lovers. So in what do the editions differ? Well both editions have a different back, a different size (Limited edition 65 x 100 mm , about 6.5 x 4 inches and the Standard deck 28 x 78 mm (about 5 x 3 inches) and also the limited edition came in a nice wooden box with the deck inside it also protected by a hand-sewn fold-over pouch in pure silk dupion and printed satin, the standard comes in the same kind of hinged box we came to appreciate from them. You can still by the standard editions at the shop, it is not a mass-market deck so it will not be available via mass-market sellers. For our convenience the Baba Studio shop has now been divided into an European and an international part the main address remains the same http://baba-store.com/ and there you will be redirected.